Hailing from a family of artists, and second son of the well known Bahar Chitrakar, thirty year old Seramuddin Chitrakar is a master artist in the making. He belongs to the Naya school of patuas (West Medinipur) and started learning his art from the time he was five or six. He began by helping his father with his patachitras. Starting with adding a blob of colour here and there, under his father`s watchful eye, he graduated to finishing pictures for his father. Winning the approval of his father, he was gradually allowed to accompany his father to the annual folk fairs in Kolkata. He also received instruction from his renowned maternal grandfather, the late Pulin Chitrakar, who taught him to accentuate the finer details. Before long, the extremely creative Seramuddin started working on his own patachitras - in the "Bangla" pata style with a hint of Kalighat. Of late, he has also been incorporating experimental ideas in his work, though staying within the traditional framework. 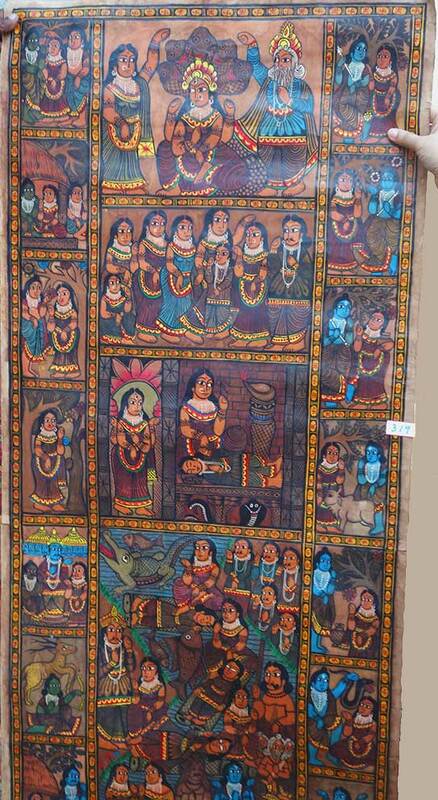 For instance, he fuses several folk themes into a single painting sometimes, say combining a Durga and Manosha. He has also tried his hand at changing the floral borders to animal motifs. His highly detailed, intricately painted duo toned (beige and black) patachitras, in particular, sometimes accented with bits of red, have won him great appreciation. It is these extremely eye catching patas that he enjoys creating the most. Seramuddin`s mantra is quality rather than quantity - and this is clearly visible in his large format patachitras. 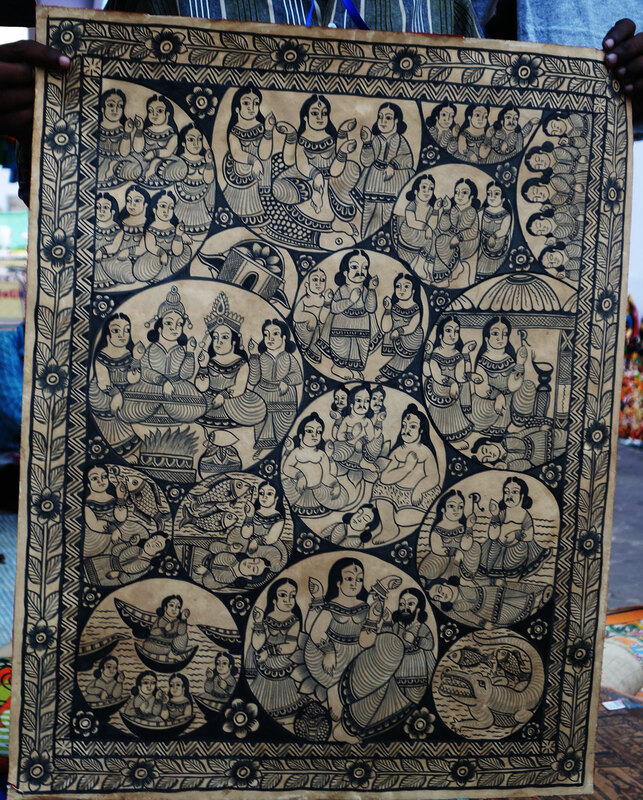 His aim is to emulate his equally talented elder brother Sahajan Chitrakar, who paints long scrolls. 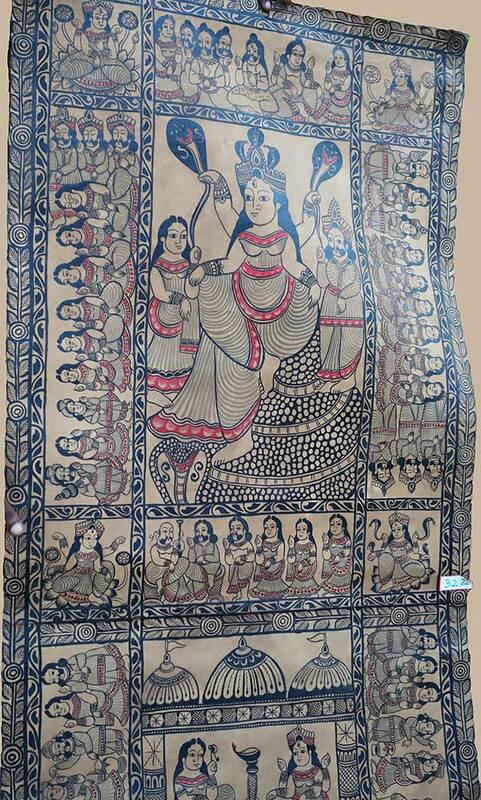 He has thus painted a few long Ramayan scrolls which have been picked up by museums. He usually does smaller chouko pots on request and of course, like his brethren, also paint on T shirts, hand fans and other such small items. He has participated in important fairs across India and won a district award in 2012. His first major award was from Rabindra Bharati University in 2015. Family circumstances did not allow Seramuddin to study beyond class V, but he and his elder brother, between them have ensured that their younger brothers are able to get an education. Seramuddin`s sons too attend school. 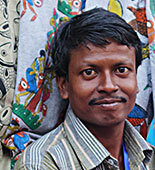 The elder, Ashiq, though only in class V, has already begun to display talent, both in his painting and singing. Seramuddin himself has learnt many songs from his father, but it his painting skills that sets this patua apart.